The lead developer in charge of transforming Cincinnati’s riverfront is off the project. The announcement comes after the developer missed a key deadline on the project and, at one point, owed the county a $500,000 penalty fee, according to county officials and documents. It had been more than a year since Carter, the developer in charge of luring new businesses, retail and residential units to The Banks, was supposed to break ground on the third phase of the project. Yet the project, for which taxpayers have invested more than $100 million in public infrastructure, remained stalled. Last year, Atlanta-based Carter paid the county a $250,000 fee to extend the start date of a new phase on the project for another year, Hamilton County Commission President Todd Portune told WCPO Wednesday evening. 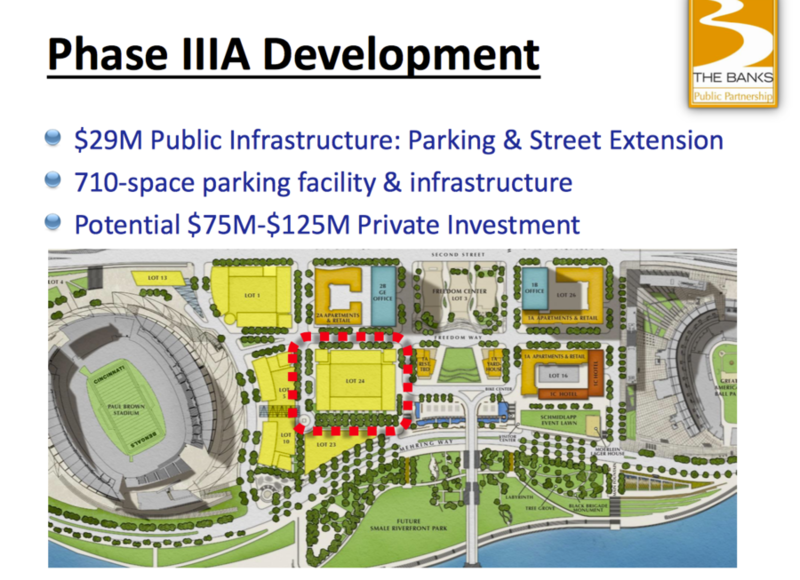 A rendering of what Phase IIIA development was supposed to include and look like. On May 23 of this year, the extended deadline to start Phase III of The Banks once again came and went. The penalty for missing the deadline again was $500,000, according to the master agreement between the city, county and Carter. Carter did not pay the latest penalty fee. Portune also confirmed to WCPO that the payment and deadlines were missed. Now, after a decade of working with Carter, Tom Gabelman, the attorney representing the county on the project announced Thursday the relationship is coming to an end. "As of today it will be announced by the city and the county, that the city and the county, along with the master developer, have determined it’s in their respected interest to conclude their partnership," Gabelman told the Joint Banks Steering Committee during a meeting Thursday. He said the county and city will now work to find a new master developer for the project. Carter will still maintain some of the previous developments it had a hand in, such as the apartments, Radius at The Banks. In a statement, Portune thanked and commended Carter for work on the project. "This project is essential to the development of Cincinnati's riverfront and remains a priority for the Hamilton County Commissioners," Portune wrote in the statement released Thursday. "We applaud Carter for successfully positioning the county toward an optimistic future at The Banks." Despite the shift in developer, Joint Banks Steering Committee Member and Reds CEO Bob Castellini praised the last decade of work on The Banks project during Thursday's meeting. "We’ve seen what I think is miraculous," Castellini said. "There isn’t anything like this in our area — just absolutely incredible." The master agreement initially signed by all parties states that missed deadlines can lead to the developer's dismissal. In the last two years, public leaders have discussed several options – a concert venue or a University of Cincinnati law school – for the next phase of The Banks. The public’s investment, too, has continued. The county secured grants to build new parking garages on time, opening up more than 710 new spaces for the project last year. But new ground to make way for private investment remains unbroken. And questions surrounding what the next phase of the project might look like have gone unanswered for months. In a series of interviews this year, Cincinnati City Council members and county commissioners told WCPO they were in the dark about the project and its future. Until Thursday, it had been two years since the Joint Banks Steering Committee, a group of power players that guides decision-making on the project, had met. Castellini said Thursday that the group had not met for two years because no major progress has been made on The Banks project. "We haven’t had a meeting in two years because there’s nothing to report. Now we have a couple of things going on here," Castellini said. "There’s no reason for us to have a meeting if we don’t have anything to report." Hamilton County Commissioner Chris Monzel told WCPO last month that he was taken by ‘surprise’ when Carter announced plans to begin a new phase of The Banks early next year. In an email WCPO obtained through a public records request, County Administrator Jeff Aluotto appeared to echo that surprise when he learned of Carter’s latest plans on June 26. “Did we get pre notice on this?” Aluotto wrote in the email, referring to a Cincinnati Business Courier article that announced Carter’s plans to begin additional construction on The Banks in 2018. The email was sent to a county attorney, Hamilton County Project Executive Phil Beck and Tom Gabelman, a private attorney who represents the county on The Banks. The county has a clear stake in what happens at The Banks: its taxpayers, along with those living in the city, jointly own the land. In a presentation to commissioners Monday, Aluotto said the next phase of The Banks could include more commercial and residential units. In an interview ahead of Thursday's announcement, Portune said he would like to see a varied and more "eclectic" mix of future developments at The Banks. He added he would like to see a decision made on a possible concert venue along the city's riverfront made quickly. A proposal for that project has been stalled for more than two years . "There was a fair amount of public discussion around that and whether they would get a nod," Portune said. Gabelman said the Joint Banks Steering Committee hopes to develop a new request for developer bids within 30 days.